The HMD 26-II-100 applies to requirements of demanding broadcast applications for studio or outside productions. 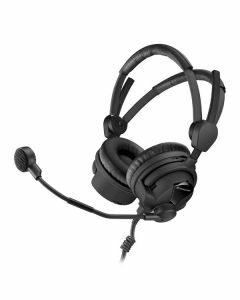 The headset is lightweight, provides extra soft ear cushions and headband paddings for outstanding wearing comfort even during long production days. This item ships with the cable ends terminated with 3-pin XLR and 1/4" jack. With a dynamic, hyper-cardioid microphone with a response up to 16kHz, the Sennheiser HMD 26-II-X3K1s are a lightweight, closed-ear, supra-aural, headset designed for use in TV and radio broadcast applications. With equally high maximum SPL and wearing comfort, these headphones do not compromise on noise attenuation. All variants of the HMD 26-II are also armed with 'ActiveGard' which safeguards the user from volume peaks. Engineered for applications in raucous environments, the microphone has a low sensitivity to structure-born sound and can be set either on the left or right-hand side. The adjustable gooseneck microphone boom permits an individual adjustment to a position uniquely suited to the user. A two-piece headband and soft ear pads introduce a further level of comfort. The cable is single sided and 'flip-away' earphones allow single-sided listening. The microphone is muted when the boom position is upright.